With all of the media attention focused on the negative, the ugly and the bankruptcy, you may not be aware of the positive, the pretty and the growth going on these days in Detroit. Today we are going to give you a new perspective, just a little slice of the positive things happening in Detroit; we are headed to Midtown for some boutique shopping, Thai food, lovely streetscapes and an “American company dedicated to making things again in America”. Let’s get started! 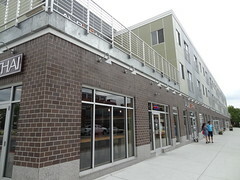 The Auburn Building is located on Cass Ave at the corner of Canfield, the structure features two stories of residential apartments above a ground floor that is home to design-focused shops and take-out, with plenty of metered parking right out front. We begin our shopping trip at Cass Corridog, owner Michelle has operated for the last two years as Woofbridge Feed and Supply out of Canine to Five, when the opportunity arose to move into her own space, she grabbed it. We are here on the shop’s opening day, large bags of dog food are standing at the back of the room, to the left a selection of toys and leashes hang on the wall. Gold toned walls and light wood make the 800 sq ft space feel warm and cozy. 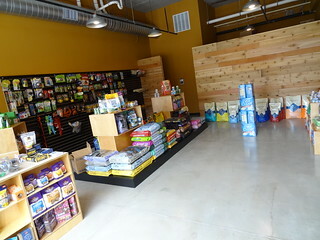 The shop sells a full line of pet care and nutrition products for dogs, cats, and even some fish supplies; the new larger space has also allowed for the addition of a pet bakery……lucky dogs! Next we wander into Nora, here you will find a pleasant assortment of items for the home, this is the kind of shop I love to browse. The room is bright and airy, walls and ceiling are pure white in contrast to the dark concrete floor. 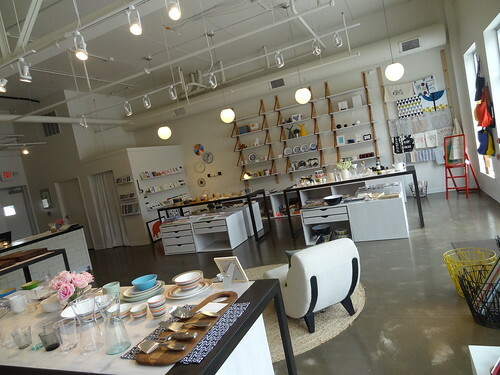 Large tables display colorful items such as serving dishes, pottery and glassware. Cubbies hold dishtowels, aprons and reusable shopping bags, funky clocks are perched on shelves, display cases feature unique Detroit jewelry. I walk around slowly, looking at everything, trying not to touch, pieces are both useful and attractive, much of it has a Scandinavian feel; the selection always changing. Selling top brands and good quality items, this store would be right at home in Somerset Mall or Birmingham. It’s a great place to pick up a gift, Nora has cards too, they’ll even wrap the gift for you! 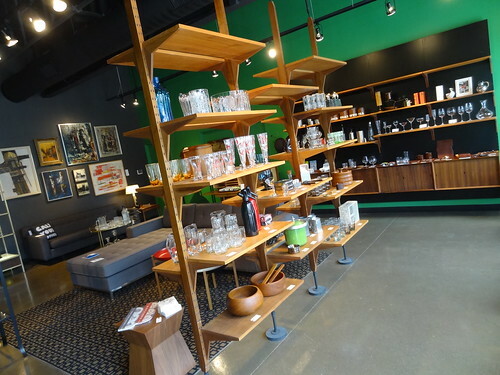 Right next door is Hugh, if you are into “bachelor pad” style, fond of the 60’s or just like really cool stuff, you need to stop in. Hugh was actually the very first winner of the Hatch Detroit competition in 2011. The place is very swanky, in that Dean Martin/Frank Sinatra sort of way. Walls are richly colored in emerald-green and charcoal grey, floating shelves and cabinets are stained dark, the furniture has clean lines and feels somewhat masculine. Glass pieces are a mix of vintage and brand new; cocktail shakers, ice buckets, martini and wine glasses come in a variety of attractive shapes and sizes. Today a wooden cabinet is off to the side, when a fellow shopper inquires about it, Joe is on his feet, he begins to open doors and unfold shelves, in a few short minutes it has become a desk–gotta love that old-fashioned ingenuity. On the other side a collection of personal accessories such as shaving kits and flasks can be found. The only thing missing is a big old 1967 Imperial parked out front…… We stop in often as there is always something new to see. 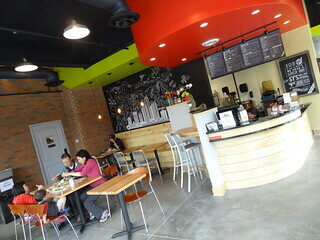 Time for a lunch break; we walk to the corner of the building and step inside Go! Sy Thai, the family owned restaurant has been operating in Birmingham since 1993, recently they opened a few new locations, we are going to give it a try. Standing at the counter we read the menu above, since both of us love Thai food, it is easy to choose. After our order is placed we take our cups to the pop machine, grab some silverware and napkins and wait for my name to be called. In no time our fresh roll and tofu tod are ready, each comes with its own dipping sauce, both are delicious. My name is called a second time, the drunken noodles wait for me at the counter. 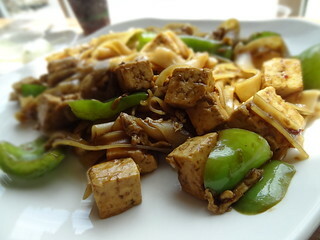 Sitting at the window overlooking Cass Ave, we watch as cars and pedestrians make their way about town, the drunken noodles are excellent, the texture perfect and just the right amount of heat, the portion is large, perfect for sharing. This is a great place to stop in for a quick meal or carry out. Previously located on the corner of Cass and Willis, Source Booksellers has made the move to the Auburn Building. 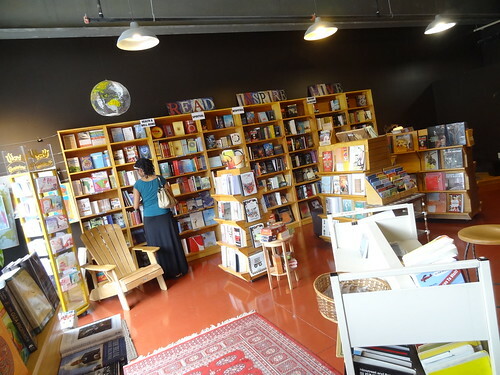 An independent, non-fiction bookstore Source features books on History, Culture, Health and Well Being. 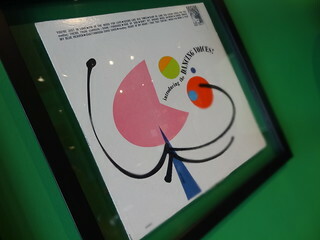 The selection is hand-picked, you can find books by and about women, the spiritual and metaphysical. The space is inviting, the terra-cotta colored floor gleams, walls are painted black, wooden shelves hold a multitude of volumes. Source offers free community activities such as Tai Chi and book talks, they also offer a small selection of world music and greeting cards. I can’t resist a good bookstore, this one has much to offer. Global Detroit Human is the next store on the block, owner Jill Drnek has brought together the Detroit designer community in a single storefront. The interior space has a great vibe, a mural takes up the left wall, free-standing clothing racks hold a variety of styles and sizes. Corrosive Clothing is well represented, selling a variety of men’s t-shirts, Six Luxe offers resort wear, Curves specializes in sizes 12-22, pieces from Homeslice Clothing and Lavinia are also available; I can’t resist checking out the purses and accessories. 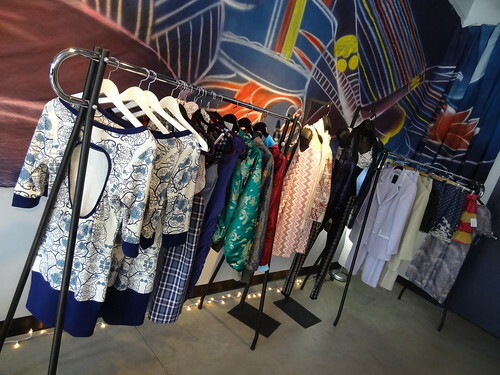 The pieces on the racks run from casual to evening, there is something for everyone. 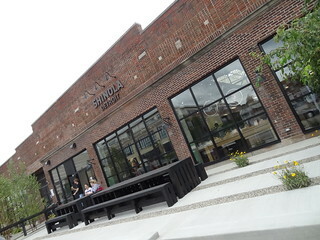 Last, but certainly not least is Shinola, located on Canfield near Traffic Jam. My how things change; the streetscape in that area has gone from non-existent to wow in a very short time. 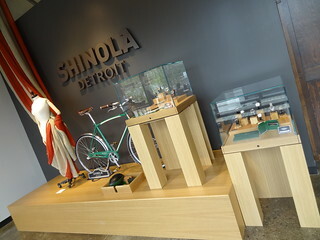 Shinola has been in the news a lot lately, and for good reason; their tag line is, Where American Is Made. Yes indeed, this is the first company in 40 years to build watches at scale in America, where in America? Why, Detroit, of course. Pardon me while I gush, but I find it refreshing, exciting and high time somebody recognizes all that Detroit has to offer. Highly skilled workers are employed by the company to build fine watches right here in the historic (1928 Albert Kahn designed) Argonaut building within CCS. 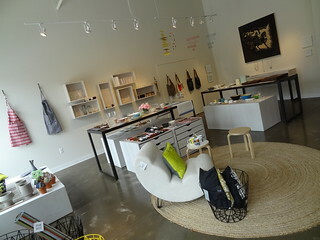 The retail shop is gorgeous! 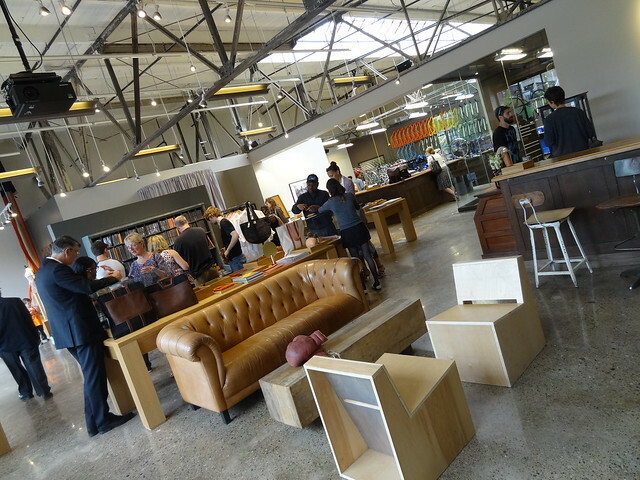 Beautiful, well made items include their signature watches, leather goods, clothing, journals and bicycles. Helpful sales clerks roam the floor, they are friendly and eager to answer questions. 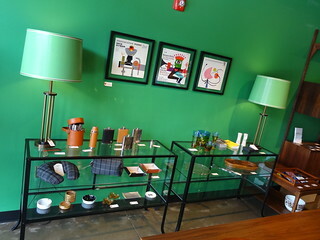 Items are displayed in an eye-pleasing way, small glass cases group things by color. 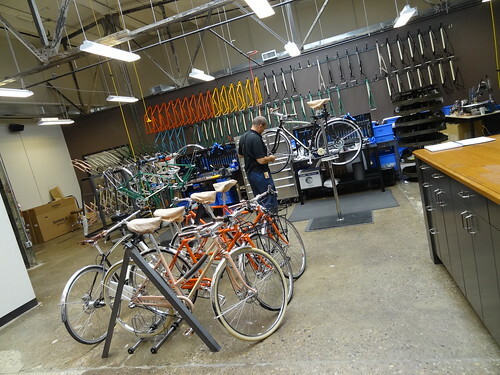 The bicycles are assembled right here, you can even watch the process, built one at a time, by hand,the finished product complete with leather seat and hand grips, even a bell if you’d like. Off to the side is a small juice bar offering organic cold-pressed juice for sale in glass bottles. Drought is a Plymouth based juice company owned and operated by the James sisters. Today they are doing a brisk business, some customers have a seat outdoors at the large community table, the juice is taken as a meal. 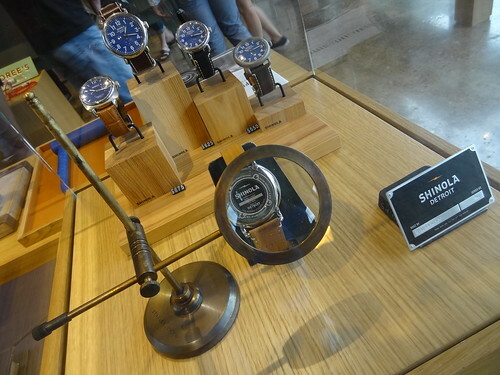 The store itself is busy, lots of folks trying on watches, each says “Shinola Detroit” on the back. I am surprised at the variety and the ability, no, the desire, to make it all in America. I love this quote from their website: “we know there’s not just history in Detroit, there is a future.” I can’t argue with that.